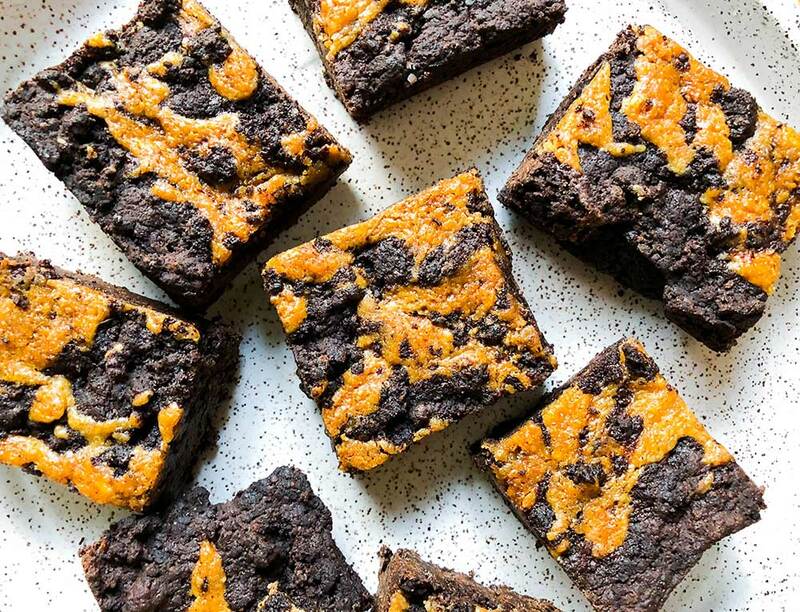 Dreamy Chocolate Tahini Brownies — Copina Co. The results of a little weeknight experimenting right here: Dreamy Tahini Brownies! They're kind of my new favorite thing and I know will be yours too. They're plant-based, gluten-free, free of refined sugar, and are unbelievably rich and gooey. I based this awesome recipe off the Tahini Brownie recipe in Healthyish, one of my favorite publications! Tahini in brownies sounds a little weird at first, but trust me it's absolutely insane. Sh0w-stoppingly, mind-bogglingly insane! What makes these brownies so rich and decadent isn't butter or sugar, but rather melted chocolate that goes right into the batter. Oh yes. It's real. If you're looking for other chocolatey recipes, check out these Fudgy Black Bean Brownies, Raw Mocha Cacao Brownies, Sweet Potato & Avocado Raw Chocolate Cupcakes, Almond Butter & Chocolate Puffed Rice Squares , and Peanut Butter & Jelly Raw Chocolate Bonbons. Preheat your oven to 350*F and line an 8x8 " baking sheet with parchment paper. Start by adding the brown rice flour and cacao powder to your food processor and pulse to combine. Using a double burner over the stove, heat and melt the chocolate, oil, and 1 tablespoon of the tahini over low, stirring until melted and smooth. Remove from heat when the pieces are melted. Whisk the remaining 3 tablespoons of tahini and 1 tablespoon of maple syrup together in a small bowl. Set aside when combined. Add all the remaining ingredients to the food processor and pulse to combine. Next, spread the whole mixture evenly in the baking pan. to do the tahini swirl, put about 6 dollups of the tahini onto the surface of the brownies. Use a toothpick to swirl them and get artistic! Bake for about 22-26 minutes, then remove the brownies from the oven and let them cool. Note: these brownies are at their best when they're completely cooled, not hot.